Captain Gravity and The Power of The Vril, published by Penny Farthing Press, 194 pages, $19.95. Joshua Jones is a hero. He just doesn’t know it. And, as a young black man working in the movie industry of the ‘30's, not many people would give him the benefit of the doubt. Destiny took a hand, however, when Joshua was “infected” by what he knows as Element 115. Readers of this volume will come to know it as The Vril, and it’s tied-in to an epic adventure involving Nazi’s, Atlantis, and an objectionable symbol with which most everyone is familiar. Readers will also come to know Joshua for the hero that he is. Unsure, a bit short on self-confidence, and certainly not unflappable, but a hero nonetheless. Writer Joshua Dysart gives us much more than the traditional hero. To his credit, he treats us to a protagonist who is more akin to what we might be, were we to put on a mask for daring-do. Much more...human. He also takes readers along for a ride that is sometimes surprising, sometimes frightening and always entertaining. Plot AND characterization. What more could you ask from a comics story? Well, you COULD ask for great art. Art that is dynamic. Art that gives characters a lot of personality. Art that is successful at portraying the heights of heroism, as well as the depths of evil. And, in this case, you would get your wish in the artwork of Sal Velluto. Velluto’s work is heavily based in realism, and can be compared to that of comics legend Neal Adams. I discovered his work when he drew the short-lived Firebrand series for DC Comics in 1996 and have been a fan ever since. Notably, his covers for the individual issues, reproduced in this tome, are, quite simply, masterpieces. 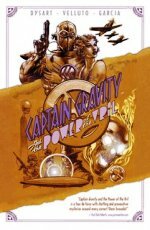 Captain Gravity and The Power of The Vril is recommended for all but the youngest readers, due to some profanity. Find it at comics shops, comics conventions and online retailers and auctions.